Make your own - personalized - board books with bristol (poster) board and clear self-stick vinyl contact paper (Mac-Tac). Cut a strip of bristol (poster) board - 5 1/4" (13.5 cm) x 26"(66 cm). Fold accordion-style into 5 squares (5 1/4" x 5 1/4") to make pages . If desired, you can round off the corners on each page . Gather ten photographs of your family, bright pictures from magazines, or use your imagination! 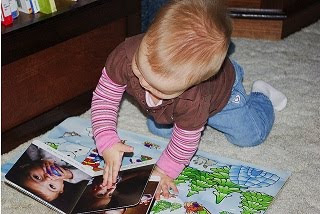 Trim to fit and paste one picture on each page , using both sides of your book. Cover both sides with clear self-stick vinyl contact paper, and trim off excess. Your baby will love it! You can make several board books out of just one sheet of Bristol (poster) board and a roll of Mac-Tac. Which is good, because these little books are addicting! You will get lots of ideas for new books to make!